A conversation with Julia Holter: "My thing with the record is sounds come first, and then the meaning always follows in this beautiful way"
Since arriving with Tragedy in 2011, Julia Holter has been known for creating stately music with a literary core behind its deeply emotional heart. Whether pulling from Ancient Greek, Old English poetry or 20th century balladry, Holter has always worn her bookish tendencies on the surface of her music, and that has fed into the wondrous worlds that she creates within her extravagantly arranged music. This Friday she’s putting out her fifth album, Aviary, a 90-minute collection that flies deeper into her love of language and literature than ever before, as it delves into her obsession with Medieval times, the malleability of words, and the role of the poet - while comprising her most sweeping and dense musical arrangements to date. We called Holter in her home of Los Angeles to get some more information from her all about the rich strands of stimulation that fed into Aviary. Speaking to us over her morning coffee, she was probably still in the process of waking up as we picked her brains about the varied citations provided with the lyrical notes to Aviary, but her early-morning brain was up to the challenge. She spoke at length, not holding back on any thoughts or emotions that sprung to mind as she guided us through the winding rivulets of her thought patterns in the creation of the album, taking my questions further than I thought was possible. Even when she would get caught up in her thoughts, or laugh self-consciously at what she perceived as a difficult thing to explain, she would continue on and always make a salient and thought-provoking point. In the end, Julia Holter has provided us with a suitably long, dense and idea-packed interview all about Aviary and its inspirations. Firstly, I wanted to ask about the original Etel Adnan quote "I found myself in an aviary full of shrieking birds," that is said to be a starting point for Aviary; what was it about that image that spoke to you? I was reading this collection of stories called Master of the Eclipse by Etel Adnan at the time, and I happened to have a lot wings and bird imagery in the songs already - usually I have bird imagery in my songs - but I think this book I was reading was resonating with things I was feeling and things that were popping up in my songs, and I found it really crazy. You know how that happens? This is going to be hard to sum up, but basically there were a few things that really resonated with me in this collection of stories; one of the things coming up in my songs a lot was memories – again, another thing that pops up in my music all the time. To me, there's something about the birds are kind of like these thoughts in your mind, flying around, mixed up with memories, and that makes sense to me. You know, memories are beautiful, birds are beautiful, memories are also terrible, birds can also be scary; we have these juxtapositions all throughout movies. The quote just seemed very symbolic to me at the time, it seemed really relevant; the "shrieking birds" are like this very loud time [we're living in], everyone is shrieking. And since you asked about the quote, I will also say that the book starts as a question that is quoted from Hölderlin, "what are poets for in these destitute times?" and this was a question that I was asking a lot when I was trying to write; I think this is a problem a lot of people have. It was just trying to find a reason, or somehow justify myself, "why am I making this right now? What am I contributing to this world that's a bunch of garbage?" [Laughs]. So this book sort of talks about that, and that was really helpful for me to immerse myself in. The story itself is really dark, and not related to my life - she's talking about a character gone to war in Iraq, and the poet existing in this aftermath of war time, and in the end she sees a vision of him in the sky, and there's all these angels and wings, and she says "I found myself in an aviary full of shrieking birds"; it's very nightmarish. I'd already had songs on my record like 'Chaitius', and wings were always present. 'Chaitius' uses this troubadour song, it was something I'd wanted to find, I wanted to find a song that talks about wings flying around, basically, and this troubadour song uses the ascent of a lark to be a metaphor for love, ascent and descent. Anyway, that was the birds thing... and the memory thing is all connected with that, in the sense that Etel Adnan also comes to this nice idea later on in this collection of stories; in another story she talks about how memories stalk us, and that really resonated with me, it's like they're just always there - like the birds [laughs]. And there's this Medieval book I've been looking at for a long time, The Book of Memory, where the writer Mary Carruthers talks about how memory functioned in Medieval times, and how it aided composition - it didn't just aid, it was the main part of writing. In that sense they would use these images of birdcages as symbols of the storage house of memory, so that was something I had been reading for a long time, and I'd already thought of this record as a little Medieval, because that's something I'd been thinking about for a long time. So that's the long answer to your question. Wow, you covered a lot of stuff I wanted to ask about… Did you put together the lyric sheet for the album, because it has all these quotes and citations on it, it has an Etel Adnan quote "That's what poets are for: to be the energy, to take part in the perennial physical and spiritual battles waged for the destiny of man...", among many other citations - so you're pretty keen for people to dig into the influences behind it? I don't think that's in the final; I made some choices about what to include, and I would say that that's a complicated topic for me. Ideally I just want people to listen to the record and not pay attention to what I'm saying outside of the record. But I think, especially for people writing about the record, I like them to know a little bit about the lyrics. I think I maybe shouldn't have included that quote because it's more than you need. I think presenting one's work is hard, and maybe I made a hasty decision when I sent that out, because it's a little much to look at that when you already have to look at all the lyrics [laughs]. Anyway, I think it was an interesting quote for me. Let's talk about the music itself; it started as voice and synth improvisations that you then took to a band - at what point did you realise you were making a 90-minute epic? I guess it was after recording - it wasn't a conscious choice at all. It just happened, and I let it happen. But I knew that I wanted to let the songs be as long as they wanted to be; I felt like I was following them, in a way. Is it almost a reaction to your last album, Have You In My Wilderness, where you were steering more towards accessible and catchy songs? I don't think of it as that, but I understand what you're saying - and I think every time I finish something I want to do something else. I think every record is different to me, it's not a trajectory in some path that I'm now taking for the rest of my life. Every record is based in what's going on with you, what's happening in the world; it's so time-based, you would never make the same record, and to me that's the fun of it. With Have You In My Wilderness, for example, I had these songs like 'Betsy on the Roof' and 'Sea Calls Me Home', I had written those songs several years earlier and I wanted to put them all together into a record of songs that were ballad-like, so that was a project in and of itself. I think it was one of the only records where there were very few borrowed texts; I was trying to make everything a little more in a tradition of ballads and not do any of my crazy collages of text and all the stuff I like to do, I was trying to reign it in a little bit, so that was a challenge and it was really fun. Now, I wanted to do something else, which was to explore something I've been deeply into for maybe over 10 years; some kind of Medieval realm. I was reading more about Medieval stuff trying to understand why I'm so into it. I've just been caught up in a Medieval world for a long time, and I had never really understood why, I'm trying to figure it out; so I was just indulging in that, "why am I interested in this? ", and seeing what happened, especially considering what was going on in the world. I didn't really know what I was going to do conceptually, I thought "I'm just going to improvise and focus on sound and get lost in cathartic sound," and that was my approach, really. The Medieval thing was a very vague inspiration, kind of existing and floating around in my head, but the main thing was "I'm really just going to focus on these sounds and dive in and see what happens." Very cool. Is there a narrative to this album? No, I wouldn't say so. In fact, I would say that there's a lot of themes that run through it, and in the end there were very specific images that I kept coming back to, but I would say that it's a very fluid record. I kind of hope that people approach it from whatever angle they want to, and from whatever point they want to when listening - it doesn't have to be from start to finish. I wouldn't really say the same for other records of mine. I don't care how people listen to my music ever, that's not a thing that I've policed, but I think with Tragedy for instance, that's a record of mine that I feel like pretty good about it being from start to finish; to me, that's how it should be listened to. Aviary I see as being very fluid, that's the nature of it... it's like the birds, you know? [laughs] It's all these things flying around. Is this the first time you've used bagpipes? Was that to do with the Medieval inspiration? Yeah! It's great! It definitely aids the Medieval thing, but it wasn't the original intention. My partner Tashi Wada started playing bagpipes a few years ago, and his father Yoshi Wada played bagpipes for a long time, so it just sort of happened that I was like "oh, I could have bagpipes in here!" to be honest [laughs]. And it's perfect because yes it's Medieval, but it's also just a beautiful sound, so I'm, very lucky. It's not such a beautiful sound at the start of 'Every Day Is An Emergency'. [Laughs] I love it! But I like funny things. I think it's funny as well, but I think many people are immediately going to hit 'skip' on that one. But they'll miss out on the amazing second half if they do that. That's not his fault, I made him play like that, that's not how he plays bagpipes usually. There's some very beautiful bagpipes in other parts. I just love the reedy sound, and the whole thing is going into this hocketing. I just wanted to make music I wanted to listen to, and I just want to listen to those instruments hocketing like that over and over again. I think you're going to be educating a lot of people about what "hocketing" is, because I've only learned about it from listening to and reading around this record. [Laughs] I think it's in most music, I don't know why I keep mentioning it like it's not. Well, no one else mentions it, even if they are doing it they probably don't know the word for it. 'Voce Simul' is about using different voices, some voices from the past, is that like a thesis for this album? I didn't think of it that way, but that's a nice thing to say, I like that! It's definitely about voices coming together and camaraderie. So sure, I think that’s a nice way to look at it. Do you feel like there's an emotional arc to this album; the middle part where it gets to 'I Shall Love 2' and 'Underneath The Moon' seems like the really happy middle part of the album. I didn't think of it that way, but I think that's a totally fair interpretation. That's all I would say, I don't have a strong prescription for how to listen to it emotionally, but it's a very emotional record. In 'Colligere' what have you done to your vocals? It's so weird and fun. I was kind of trying to sound like a robot when I sang, and I then I think we also sped it up slightly. We went through a lot of different versions, so I don't remember what we ended up doing exactly, but that was a conscious thing with that, trying to sound kind of like naturally auto-tuned. Why did you want to sound like a robot on that song? Cool! 'In Gardens' Muteness' is probably my favourite track, but I feel bad about saying that because it's the simplest, most stripped-back in terms of arrangements, it's basically just you singing on piano. But I wanted to ask if ‘In Gardens’ Muteness’ is related to the album cover? Whoooa! Oh cool, I did not think about it like that. But I'm sure it is, you know? So what is the album cover, who created it? Dicky Bahto, who's made all my recent album covers. He does a lot of different things in his art, but he had been doing these layered projections, and I really loved those. In this record I'm thinking of future and past, time blending, everything all at once in one space. So we took photos of Los Angeles at night and also Medieval imagery of certain times, and we also ended up taking pictures of flowers for some reason, and then we just played with all of these different images, collaging them through projection, at that one came out. We also took photos of me, obviously, because one of them's a photo of me, and I'm just in the kitchen looking up at the ceiling. We collaged it together, and it was exactly what I wanted - I had been envisioning this image of someone looking up and the birds of the mind flying around, trying to detect the mind as the aviary. It was a coincidence, we were playing around, it wasn't like we tried to make the flowers look like they were flying, but that's how it happened in the projection. I can't wait to see it on the record cover itself. Me too! I haven't seen it yet! In 'I Would Rather See', I don't know if you remember doing this, but on the lyric sheet you've encoded "IF NOT WINTER ANNE CARSON" into the lines of the song. I know! It's supposed to be a mesostic, but it probably looks insane on that document. Anyway, it's a mesostic, and it uses Anne Carson's name and the name of the book. How does that book relate to the song? 'I Would Rather See' I made in maybe 2011 or 2012, and I guess I was reading at the time the Sappho translations that Anne Carson did that are very famous now - there's a Twitter bot that tweets quotes every day. I just loved it, I was reading it and I felt like making a song out of this text, which is something I do a lot I guess. Mesostic is something I do a lot of times to generate text, because I like to use these types of ways to make text instead of coming up with it off the top of my head - it's more fun to use a process to see what happens, it's more surprising. It's a John Cage thing, it's a chance procedure that allows you to make a poem out of any text, so you end up taking some words by chance and some words by choice using this simple procedure that anyone could do, and it generates a poem using some of the text. It's just a way to make a poem out of something, basically, and that's what the text for this song is - it's from the Sappho poems that Anne Carson translated. Interesting. So, 'Les Jeux To You', why did you put "Les Jeux" in French - just because it sounds good? Yeah, actually! But all the stuff in other languages has meaning as well. Like in 'Chaitius' (which means "wretched" by the way), I was inspired by the famous troubadour song originally in Occitan, and there's a translation of it, so I was playing with the text based on the sounds. In 'Chaitius' especially, and the same goes for 'Les Jeux To You', I was excited to listen to words for the sounds without immediately knowing the meaning. In fact, my whole thing with the record is sounds come first, and then the meaning always follows in this beautiful way; especially when I do a mesostic or a phonetic translation - like 'Why Sad Song' is a phonetic translation of a song in a different language. To me, what's exciting about that, is it's going beyond what I would come up with, and it can be very fun and you can find all these meanings that you didn't know were there. With 'Chaitius' it was very much about wanting to play with words until it was a language but not really; I basically think of all lyrics in music, since they're not actually language, they become music, and I just love to run with that. In 'Chaitius', all of the words I picked based on what they mean, but I first picked them based on how they sounded and then was like "does this make sense a little bit too?" and it was yes, it felt poetic. I feel like sometimes when things sound good, it also means that they mean something, it's interesting. With 'Les Jeux To You', I always liked the word "games", and the whole song is supposed to be a word game; it's a very expressive cathartic song with language, it's like you're struggling to get to a place where you're communicating with someone, but maybe you're communicating just through the sound of the words. That's cool, because when I listen to it and read along the lyrics, for some reason I was imagining like a very impassioned game of Scrabble. Sure... that sounds like a very tame version of what I was feeling, which was a little bit more insane and feral, but I think maybe if you're playing Scrabble and you're all naked or something... [laughs]. You've littered the album with literary references, but are there any more accessible books or texts that you would recommend to people? Well, first of all, I don't always know what "accessible" means, because I don't think that I'm a particularly high-brow person. Sappho, to me, is accessible; I think everything that I work with in my music, the reason I always cite all these references isn't to be like "look at all the stuff I've read." I know that because maybe sometimes it's older stuff it seems that way, but I'm a very scattered person and I do not have a deep understanding of the history of Greek literature - everything is very honest. I basically think art is a process of translation, all of these works I have to credit because I worked with them in some way to generate what I'm doing, so I'm very honest about what those materials are, and that's why I reference them. In a way, I'd rather not have to for listening, because I'm just trying to make music, but it's also very important to reference those things for me. That's an ongoing question because I don't like to draw too much attention to it. Your question I understand, in some way, but I just also hope to emphasise that these are accessible to me, and I think they're accessible to everyone. Etel Adnan I think would be very, very wonderful for people, it's just something that I've been reading, and her work is from a Middle Eastern perspective, so I really recommend her writing, and I was really happy to mention her a lot while doing this. I'm just trying to be clear that I'm super passionate about this stuff; sometimes I have problems with the word "accessibility" because it doesn't give credit enough to people, I feel like a lot of people these days are interested in history. But, to answer your question, I've been reading Edward Said recently, I'm reading his book about the artists' late periods in writing. Another book that I was reading a lot while making this was a book a friend recommended to me called A Distant Mirror by Barbara Tuchman, it's pretty crazy, it's like 600 pages about the 14th Century, but I thought it was very interesting - it took me over a year to read (I'm a very slow reader). I'm gonna start reading this book about the invention of race in the European Middle Ages, which seems really interesting. I've barely dug in, but it looks really good. I don't know if this is considered accessible, but to me it is... But Master of the Eclipse by Etel Adnan is a really great book for people to read; it's just very emotional and again related to this question of "what are poets for in these destitute times?" 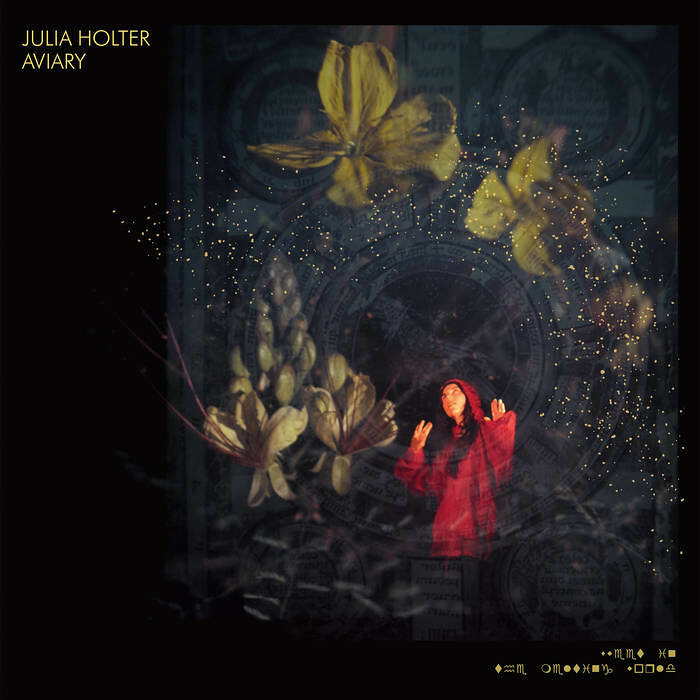 Julia Holter’s new album Aviary is out this Friday, October 26th, on Domino Records.